Did you know that there are dog food dangers looming where you least expect them? 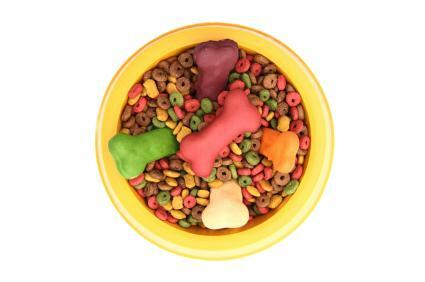 Aside from the occasional problems in dog food manufacturing, there are foods that your dog should never eat. Read on to find out more about foods that are unhealthy for man's best friend. Walk down any pet food aisle in a local pet store or retail store and you'll be surprised at the number of dog food brands available. While some are old standards in the dog food business, there are always new brands from which to choose. How do you decide which foods are healthy for your dog, and which ones aren't? Processed dog food should consist of approximately 10 percent carbohydrates, 40 percent meat and 50 percent vegetables. When reading the label on a can or bag of dog food, the first items listed should be meat protein, followed by vegetables and then carbohydrates. While carbohydrates do provide sustainable energy for animals, many dog manufacturers use ground meals. Whole grains are the healthiest for your pet. Keep in mind though that corn is not very digestible for dogs, so avoid foods that have a high corn or cornmeal content. Most dog food manufacturers put fillers in their pet foods. Most fillers aren't dangerous to your pet, but they usually don't add any nutritional value to the food either. Fillers that are commonly found in dog food are cornmeal, oatmeal and flour. When dogs are given filler ratios that are higher than 10 percent of the total food mix, it may cause stomach upsets. Any or all of these items can pose a health hazard to your pet. If you notice that your dog is drooling or acting extremely lethargic after eating commercial pet food, seek the advice of your vet immediately. Animals can suffer from kidney failure or other serious health problems if they have an allergic reaction to their food. If your pet consumes any of these food items, call your vet immediately; this especially true if your dog eats chocolate. Many pet owners find that preparing their own foods and pet snacks is an easy way to make sure their pets are getting the best nutrition. If you are unsure about the safety of the pet food your animal is eating, try making a few batches of pet food in your kitchen. You may find that it is easier, and less expensive, than you think!